A deceptively simple running machine that can deliver a challenging workout, manual treadmills pack an extra punch for cardio fitness. We’ve done the research and gathered the best manual treadmill picks for you to check out. You’ll learn everything you need to know, including the pros and cons of each pick, to find a treadmill that’ll keep you fit and healthy. The top dog for its easy set up and heavy-duty, smooth operation. This is a great option if you want to experience the benefits a manual treadmill can offer. One of the most advanced manual treadmills available. Commercial-grade durability and lots of high-end features other curved models lack. The best budget pick due to pro-like features like the durable build, smooth flywheel, and LCD monitor to track workout stats. A unique model with adjustable magnetic resistance levels. A great choice if you want something easy to move/store. One of the best for stability and security with a wide, long belt and extra-secure handles. Easy to fold up, store, and move around thanks to built-in transport wheels. Good warranty on frame/parts. Decent user weight limit of 250 pounds. Bluetooth connectivity, hi-contrast LCD console, belt life, and corrosion-resistant steel hardware. Long 44-inch belt, ideal for longer strides. Easy assembly with all parts included. The multi-functional onboard computer that tracks total distance, speed, and calories. Lightweight, durable frame. Durable steel construction supports 325 pounds of weight. Built-in heart rate sensor. A less durable frame that won’t last as long as more expensive models. 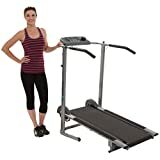 A higher price that puts it above most of the other manual treadmill models. Belt requires more regular maintenance than other models. The compact size won’t be suitable if you’re tall or have a long stride. The frame can wobble at higher speeds. The incline maxes out at 12%. Why Trust Us? Fitness Goat spends hundreds of hours researching products to recommend the best picks for most consumers. We never accept free products, do paid promotions, or hide behind our website. If you would like to know more, please contact us here. More weight loss. Choose running over walking to burn more calories and lose more weight consistently. You can burn an average of 300 calories when running at 8 MPH for 20 minutes. Regular running is also great for the heart and lungs. A more active lifestyle. A manual treadmill at home will keep you active even when the weather is gloomy outside. You’ll glean the benefits of greater mobility while protecting your joints on a cushioned tread. Saved space. Don’t sacrifice the living room to fit your fitness equipment. With a smaller footprint than motorized models, manual treadmills take up less space in your home. Some even fold up for easy storage. Safe and quiet. If you don’t want to annoy the neighbors, manual treadmills are almost completely silent. No motor equals less sound. Using one is also safer than a motorized treadmill since the running belt stops when you stop. Most manual treadmills have small footprints which make them great for smaller homes or apartments. It may seem obvious, but the effects of a no-motor setup need to be experienced. Forget about the complexity, maintenance, and wall outlet an electric motor requires. Even set up is easier: unbox the treadmill, pick a spot, set it down, and get going. No power means you’re doing all of the work. Studies show that users experience a 20 bpm higher heart rate using a manual treadmill. That also means a 30% uptick in energy use, which is great if you’re looking to lose weight and boost your fitness level. Your heart and lungs will thank you. Without electricity to power it, a manual treadmill stops when you stop. That makes it safer, especially if you have kids in your home. You don’t have to worry about little hands pressing buttons that’ll send the belt spinning around uncontrollably. If you feel like a regular treadmill can be too confusing to use, you aren’t alone. That’s why so many people seek out the manual models. Without a powered deck, you don’t have to master different controls and settings that require a lengthy manual to use. $150 and under: You’ll find mostly budget manual treadmills at this price point. The models all have a flat tread deck and come with few features. Some include an onboard computer to track exercise stats. Construction and quality are on the cheaper side. $350 and under: The typical range for good-quality, flat manual treadmills. These are still budget-friendly and come with a few useful features like single-button electronics and a heavy-duty flywheel. 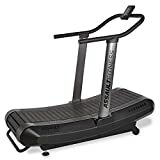 $3000 and over: Most curved manual treadmills start in this price range. The build quality is high, and you’ll find a number of high-end features like Bluetooth connectivity for smart devices. Most options are very durable and maintenance free. The very thing that makes a treadmill a treadmill. The moving belt runs on rollers that should let it glide with as little resistance as possible. Extra padding on some models helps lower the exercise’s impact on joints. Most manual treadmills look just like their motorized counterparts: flat. These are very economical, but if you want a better workout, look at the curved models. They offer a more intense workout and greater durability. One drawback to some manual treadmills is a lack of stability. If you try to run without something to hold, gravity may choose to test your balance. That’s where a good, sturdy handlebar comes in. A light hold is all you need to stay upright. Despite the simplicity of a manual treadmill, you can still adjust it to your liking. Raise or lower the incline manually to simulate walking on flat ground or a hill. Usually, a number of different incline levels are available. The belt resistance is also something you can adjust manually through a magnetic flywheel. Manual treadmills lack the fancy, high-tech features of motorized models but are still quite capable. Basic LCD panels can keep track of distance, speed, and other important metrics just like on regular treadmills. It’s no secret that a treadmill takes up a lot of space. Manual treadmill frames have the advantage of being smaller since there’s no motor, but the true space-savers go further by folding. A hinged frame shrinks the average treadmill’s footprint by about 50%. If you want to keep the treadmill out of sight when not in use, you’ll need some help. Built-in wheels make the job easier to move the treadmill around or out of the way when you want. Otherwise, heavy lifting is required. Space: Manual treadmills may be easier to fit into smaller spaces, but don’t ditch the tape measure just yet. Consider how much interior space you have to fit the treadmill so you don’t struggle when positioning the frame. Portability: If you want something that’s easy to move around, choose a manual treadmill with transport wheels and a folding frame. Height and Weight: Your height will determine how long the tread deck should be. If you’re over six feet tall, a 60” deck is a necessity. Otherwise, choose something that’s at least 50” long for walking or 55” long for running. If you’re over the common 325 weight limit, choose a treadmill with a more durable frame. Usage: How you intend to use the manual treadmill will determine which model you should buy. If you want to walk or jog, either a flat or curved treadmill will work. If you want to run or do HIIT workouts, curved treadmills are your best bet. Few manual treadmills rival the convenient setup and smooth operation of the Phoenix. If manual treadmills remain mysterious to you, this model will give you the best feel for the experience. It’s easy to set up and take down with a solid frame that folds and locks securely into an upright position for storage. You’ll get an intense workout thanks to the heavy-duty, weighted flywheel and 41×13-inch belt that offer a smooth, quiet experience. The belt is an excellent size for walking and jogging up to 4 MPH. To measure your progress, the single-button LCD display tracks your total distance, time, speed, and calories burned. Overall, this treadmill is well made, but you get what you pay for. The frame won’t last as long as a more expensive model. It’ll be enough, however, to give you a grueling workout multiple times a week. Featuring heavy-duty construction and a flywheel with smooth operation, this manual treadmill has a lot for a budget option. It features an LCD monitor display to help you keep track of all your important workout stats and folds into a locked, upright position. The belt size is 44 inches, which is longer than similar models, making it ideal if you’re tall. Assembly is also easy since the treadmill ships with all the necessary parts. One drawback to this model is the fact that the belt needs frequent tuning to run smoothly. If you aren’t handy with some basic hand tools, you should look elsewhere. Thinking about upping your running game with a curved treadmill? For the best, there’s only one option. The AirRunner is one of the most advanced manual treadmills out there. Featuring a commercial-grade frame, all the hardware is corrosion resistant. Its durability comes from its solid-steel construction with a 350-pound limit and 150,000-mile slat belt. The features on this treadmill allow you to push yourself as much as you want. With no speed limiter in the belt, you can test your sprinting speed. Measure your progress with the Bluetooth connectivity and hi-contrast LCD console or track workout stats on your smartphone. The only drawback to the AirRunner is the high price tag. If you’re looking for something more budget-friendly, this isn’t for you. The Confidence packs a punch in the compact department. This model easily moves around with the built-in transport wheels. A simple locking pin keeps the treadmill folded securely. Unfolded, its lightweight frame is strong enough to support up to 220 pounds of weight. The tread width and length is 14×39 inches, making it perfect if your stride isn’t too long or wide. With a fixed, gentle incline, the treadmill has eight different levels of quiet, smooth magnetic resistance to customize your workout. A multi-functional computer tracks total distance, speed, and calories. Given its compact size, this is not the right treadmill if you’re tall. Also, keep in mind the frame is less sturdy than some competitors and may not as long as more expensive options. The Exerpeutic 100XL’s is a good choice if you’d like to not worry about the right fit. 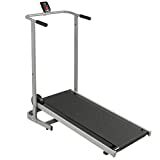 The durable steel frame is wider and longer than other manual treadmills and supports 325 pounds of body weight. Its twin flywheels also provide a smoother, more consistent workout than single-flywheel treadmills. The extra long safety handles provide additional stability while walking, helping you stay balanced at higher speeds. Heart rate pads track your pulse while exercising. With the magnetic tension pace control, you can even walk hands-free at select speeds. You may get a more exciting workout at top speeds since the higher pace tests the frame’s stability. The maximum incline is 12%, so if you want a steeper uphill challenge, this isn’t the pick for you. Use a curved manual treadmill for sprinting, HIIT training, or a generally harder workout. Keep your body upright while running to maintain balance. Buy a treadmill mat to avoid scratching your floors. Walk or jog lightly on flat manual treadmills to maintain balance. Q: Can you run on a manual treadmill? A: Yes, it’s definitely possible to run on a curved manual treadmill. The belt on most flat treadmills, however, won’t go higher than 4 mph. Q: How do you use a manual treadmill? A: It’s really simple: step on, move the belt, feel the burn. That’s it! All the power comes from your body and effort. Q: How easy is a manual treadmill to get started? A: There’s some resistance to overcome as you get the belt going. Once you’re up to speed, it’s easier to keep the belt moving. Q: Do you have to hold onto the sidebars to use a manual treadmill? A: You don’t have to, but they offer additional stability when moving the belt. Otherwise, you may tumble if you’re not used to the movement. Q: Do they work on carpets/hard floors? A: Yes, but we recommend you place a treadmill mat underneath the machine so you protect your floor. This also adds extra stability to the treadmill to keep it from sliding around during your workout. Manual treadmills take cardio fitness up a notch from their electrified cousins. If you want the best, we recommend the Phoenix 98510 Easy-Up. Its foldable, portable design, combined with the durable construction, make this a great choice for your home gym. Now, let’s hear from you. Which models are you considering and why? Let us know in the comments below! 6 Best Upright Bikes: Our Top Picks for Serious Sweating!